The KL 40 utility log boiler produces up to 38.6kW of heat, making it ideal for providing heating and hot water for large houses. It maximises the heat from the flue gases as well as the flames, giving it an 83% efficiency rating. Its smaller sister, the KL 29, has a heat output of up to 28.8kW and burns with the same high efficiency. 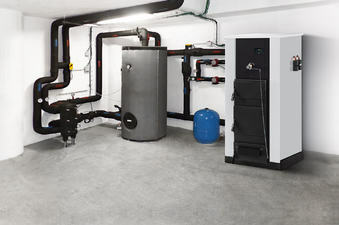 We would usually recommend installing the utility boiler with a thermal store, as this allows the boiler to run at full output until the store is hot, and the heat can be stored until needed.